Modernisation and digital transformation of defence is firmly on the agenda with much focus on Command, Control, Communications, Computers, Intelligence, Surveillance and Reconnaissance (C4ISR). The demand for C4ISR systems is being driven by the need to achieve modernisation, a rise in asymmetric warfare and the growing requirement for flexible interoperability and integration of systems and networks to support military operations. Robust standards have to be met before a device can be considered by a defence organisation. So what are the major challenges facing defence organisations when it comes to deploying end user devices in the dismounted soldier space, and what are the solutions? Challenge: Equipping dismounted soldiers with the technology that allows them to securely collect, access and manipulate sensitive and critical data is a necessity; it could mean the difference between a successful and failed mission. With the threat of cyber warfare, hacking systems and infiltration, security of data continues to be the top consideration for any defence digitisation strategy. Commercially available traditional endpoint security is generally insufficient for the high levels of data protection required to meet rigorous security requirements and minimise exposure. Solution: Data needs to be encrypted and protected against attack, theft or intercept when it is at rest, in use or in transit. This means both hardware and software must be encrypted, and extends to system hardening, peripheral control and centralised management, all of which significantly improve the ability to control devices, enforce security policies, and provide audit trails and reporting, while reducing support and maintenance overheads. Administrators can have complete control to create separate encrypted user accounts or personas, enforce strong authentication, and manage different application and device policies. To counter any limitations of software and hardware encryption, blister packs and bolt-ons for specialist devices can be added that meet the hardware security required by government. Getac devices have the built in security measures to secure both data at rest and data in use. It has an ecosystem of partners such as Trivalent that provide next generation data protection services. Trivalent’s unique Data Alchemy™ solution renders data completely unusable by unauthorised parties. Trivalent Protect for Android is the only NSA Commercial Solutions for Classified (CSfC) certified data-at-rest (DaR) solution. It is developed exclusively with the warfighter in mind to securely handle Top Secret and below data. The integration of Trivalent’s software security into Getac’s line of Android tablets, delivers seamless, robust data protection for the first time on rugged computing devices. 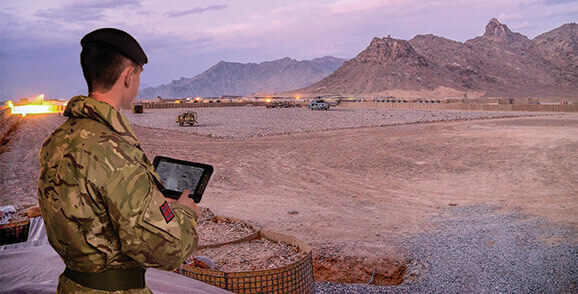 Challenge: Defence teams rely on mobile connectivity to enable mission critical communications between responding resources, control rooms and other crews. In a situation where there is a congested network or where connectivity is patchy as troops traverse different environments, vital communication is reduced, delayed or cut off completely, resulting in additional risk to life or a mission. Solution: Secondary and tertiary communications systems should be made available to provide a limited capability with minimalistic functionality. Challenge: There is a dichotomy between technology trends and what is actually functional in computing for defence. Traditionally specialist mobile devices for the defence sector have been power hungry, heavy and cumbersome, but today mobile devices have become smaller and more powerful in the consumer world. Defence are eager to adopt this capability in the battlefield because they are small, lightweight, fast, easy to use, intuitive, and have interoperable operating systems, loaded with apps. But consumer devices will quickly fail in military environments and cost more in the long run. Solution: A new breed of ‘consumer rugged’ COT devices can provide the right balance. Getac manufactures natively rugged mobile devices that combine an intuitive consumer-like experience with longer battery life, robust hardware that will stand the test of the battlefield, all the while providing the necessary security, interoperability and performance needed. Getac offers a full range of customisable rugged mobile devices and software integrations specifically designed to support battlefield digitisation strategies and evolving modern warfare practices. Its devices have an average life span of three to five years, while products are refreshed every 12 to 18 months, meaning that they’re consistently up to date with the latest technology, components and features. Getac’s MX50 5.7 inch IPS display tablet is its first rugged mobile device built specifically to address the mobile computing challenges of dismounted soldiers. Its consumer device-like experience, running on Android, is combined with more power, robustness, security and functionality required dismounted soldiers on the battlefield. It is powered by the latest Intel mobile system on chip (SOC) processor for high processing speeds and low power consumption so soldiers can quickly view, manipulate, send/receive data, access battlefield applications, disseminate blue and red forces tracking, fire control orders, and mission command information. The device has undergone rigorous testing and is certified to Military Standards 810G and 461G, meeting current, legacy and future GSA standards. The rugged nature of the device means it can withstand drops and other impacts, operate seamlessly in extreme weather conditions - from -21 to +60 degrees celsius - and EMC environments, and has an Ingress Protection (IP) rating of 67. It includes Getac’s signature LumiBond® screen technology for readability in sunlight, and brightness of up to 480 nits. Multi-touch means dismounted soldiers can use glove, touch or and pen modes even in the rain. Getac’s Bumper to Bumper support solution gives end users confidence and peace of mind that, should the device be damaged, it will be repaired or replaced free of charge. Getac’s MX50 is compatible with a large number of IEEE communication protocols, making it interoperable with a range of external hardware and drivers, such as Tactical Hubs which provide USB 2.0, USB 3.0 and power to the device. The latest Android OS makes it easy for third party applications and soldier Battle Management Systems (BMS) to be loaded onto the device as required. Getac MX50 is also designed to be quickly snapped into a tactical vest check mount. There is also an option to achieve limitless power with Getac’s Life Support technology, with an additional snapback hot swappable battery. Getac’s X500 notebook and X500 server products, further strengthen its proposition for the defence industry. The fully rugged 15-inch X500 is Getac’s most powerful notebook available today with the latest high performance processors, Wi-Fi and connectivity capabilities. It allows deployed soldiers to rapidly access and process high density data such as 3D graphical mapping of an operational theatre or terrain for situational awareness, while keeping them agile in extreme environments. Getac’s X500 mobile server, a portable device that resembles a rugged briefcase, can store up to 6TB of data. It meets the intensive data and mobile cloud storage needs of temporarily deployed, rapid early entry and emergency response teams. It can be used to capture analytical and mission data from dismounted troops, ground or air platforms using X500 notebooks or other mobile data devices. Teams can also use the device to analyse platform, mission and engine data to ensure operational sustainability in high demand environments. The X500 devices are certified to military standards MIL-STD 461G and MIL-STD 810G, providing reliability in the harshest theatres. Due to its open architecture it remains fully compatible with current, legacy and future Generic Base Architecture and Generic Vehicle Architecture standards. The Getac Secure ecosystem delivers robust multi-layer security to the highest standards for both hardware and software. Robust encryption protects data in use and at rest. Both the X500 notebook and server benefit from Windows 10 security features including tamper-free start-up, data protection and multifactor authentication. In the event that the system is compromised or stolen, optional Mobile Device Management software will allow it to be disabled remotely.